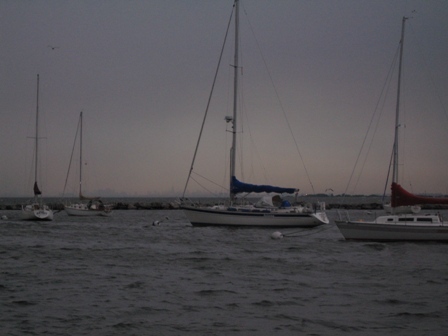 We sailed for two days after leaving Norfolk on our way to New York. The last night was not to be without its challenges. We encountered severe thunderstorms along the stretch of coast just south of Sandy Hook, and more were predicted for the next day. Although the sails are readily reefed for the increase in wind, the lightning strikes into the ocean keep our knuckles blanched. Fortunately, the storm systems show up clearly on our radar, helping us dodge most of them. At one point we even headed south again to miss a particularly nasty looking system that was passing west to east in front of us. Despite the large copper mast grounding plate that we had installed before we left, and the theoretic Faraday's cage effect protecting the area below the rigging, we stayed mostly below deck with the auto pilot keeping the boat on course. Back-up instruments were stored in the oven to act a an additional Faraday cage in case of lightning induced electric surges. With more thunder storms in the forecast for the next day, we decided to remain cautious, and stop in Atlantic Heights, NJ (see above), just inside Sandy Hook, rather than press on to reach New York City. 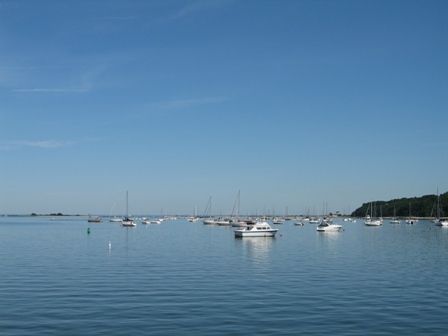 The secure mooring field behind the break water of Atlantic Heights as seen from the deck of Dalliance. The skyline of New York City can be seen faintly in the distance. 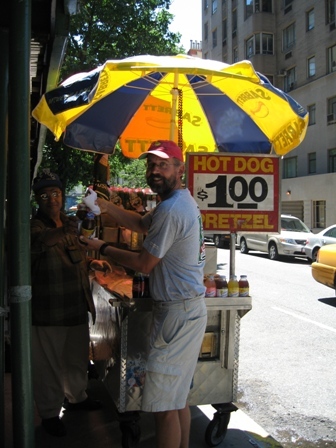 We were able to enjoy the town, which had a remarkable small village feel, considering the proximity to New York City. 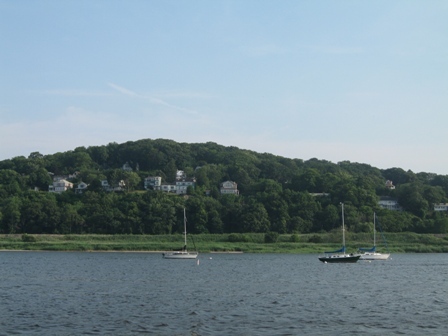 According to the locals, the town has changed since the arrival of a high speed commuter ferry to New York City, and has become more of a high rent bedroom community. 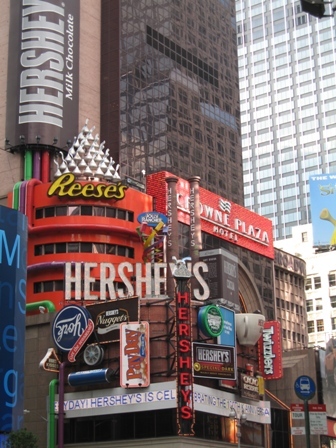 In a mere forty-five minutes you can be in downtown NYC. 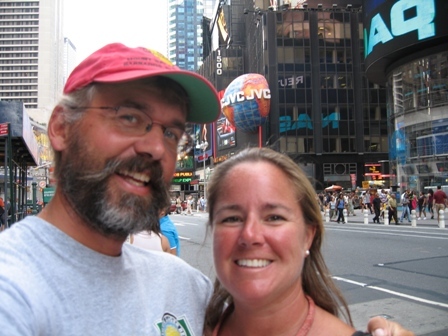 On June 29th, we headed for New York City at last, under cloudy skies and light winds. 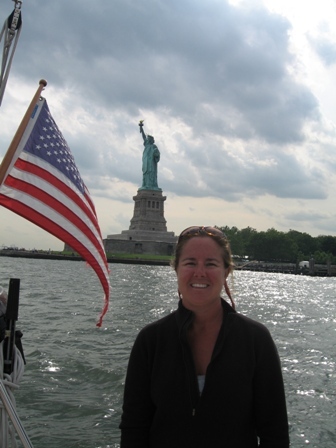 To cruise along the Statue of Liberty was a amazing experience! There are few landmarks that provoke such an emotional experience. Emma Lazarus' poem "Give me your tired, your poor, your huddled masses yearning to breathe free" rang true to us. The statue was a gift from the French to the American people. 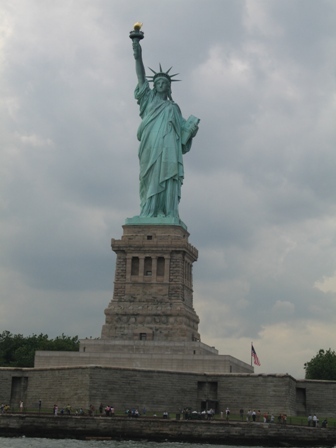 The design was made by sculptor Auguste Bartholdi, as a monument to the freedom that he found lacking in France. "I will try to glorify the Republic and Liberty over there, in the hope that someday I will find it again here." The frame was designed by Gustave Eiffel, who later build the Eiffel Tower. The statue was unveiled by President Grover Cleveland on October 28, 1886, and restored for its 100th anniversary in 1986. 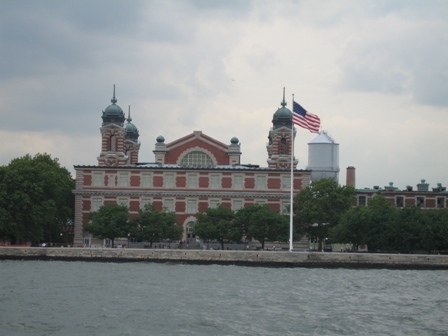 Ellis Island served as the immigration depot from 1892 until 1954, during which nearly 12 million passed through its gates. 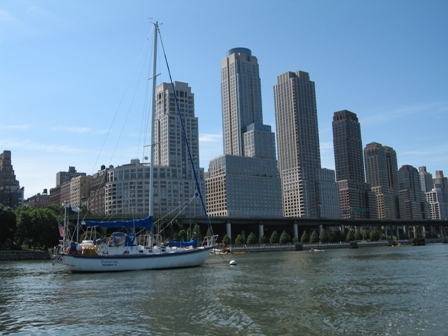 We stayed for three days at a mooring at the 79th Street Boat Basin. 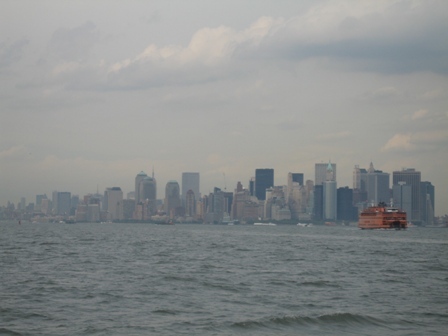 Due to the swift tidal currents in the Hudson River anchoring would have been risky, especially since we would be off the boat exploring the city. 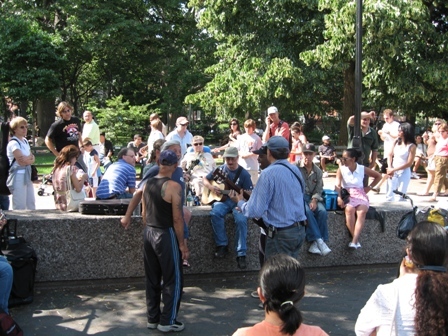 The Boat Basin was a short walk away from Central Park and the Metro, and was an ideal springboard into the city. We walked for about six hours each day, taking in the sights with beautiful sunny weather. 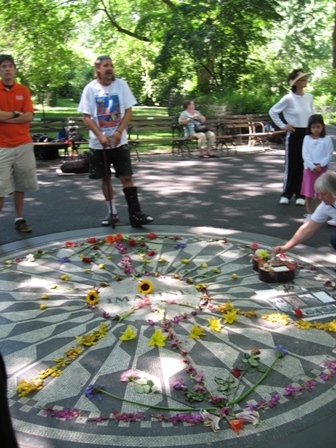 Close to the Dakota on 72nd Street, there is a memorial to John Lennon in Central Park, which remains popular with people paying homage to one of music's greats. 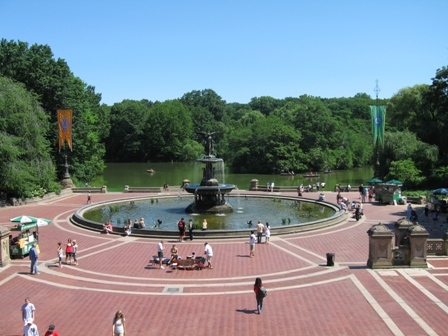 One of the many fountains in Central Park which host various local musicians. The City seems far away in this pastoral place. 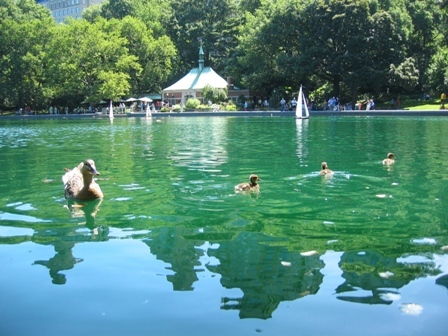 Conservatory Water, also known as the Model Boat Pond, hosts model sailboat racing every Saturday. 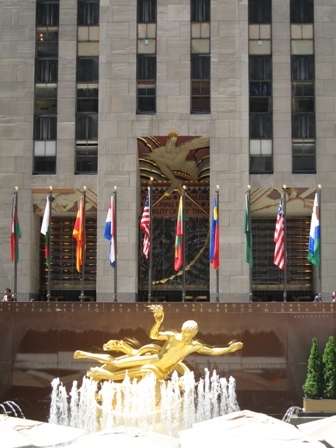 Rockefeller Center was declared a landmark in 1985, and called "the heart of New York...a great unifying presence in the chaotic core of midtown Manhattan." In the background on the facade of the GE building is "Wisdom" by Lee Lawrie. "Wisdom and Knowledge shall be the Stability of Thy Times". The towering Empire State Building is now the tallest skyscraper in New York at 1454 ft (443 m). 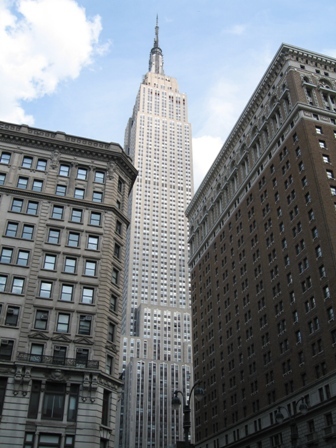 In 1933 the building was featured in the movie King Kong, where he fights army airplanes from its spire. 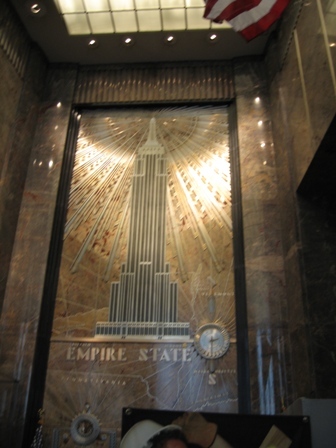 The 5th Avenue marble entrance lobby, with a relief image of the building superimposed onto the map of New York State. 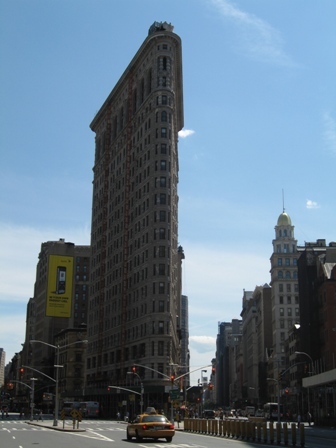 The Flatiron Building overlooking Madison Square was one of the city's first skyscrapers in 1902, and at that time the tallest in the world. 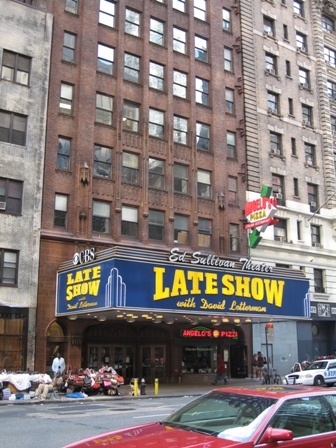 It was one of the first buildings to use a steel frame, allowing buildings to be build taller than ever before. 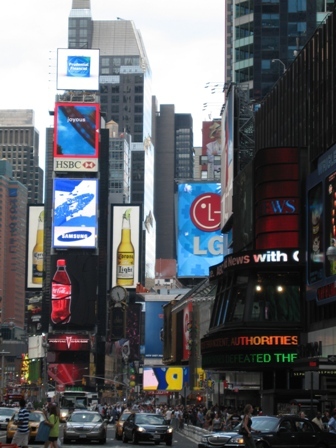 Two tourists dazzled by the neon, and towering buildings of Times Square. 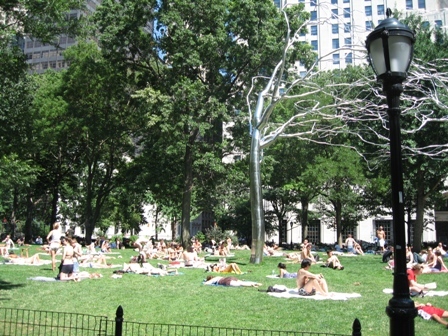 A day at the "beach" in Madison Square Park. Plenty of cool familiar landmarks. We also made a stop at the Museum of Modern Art. Although the section on industrial design was very interesting, we found some of the modern art puzzling. 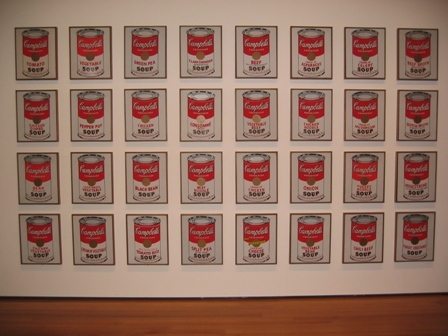 Even this work by Andy Warhol has made one wonder: Is it art, or just soup? 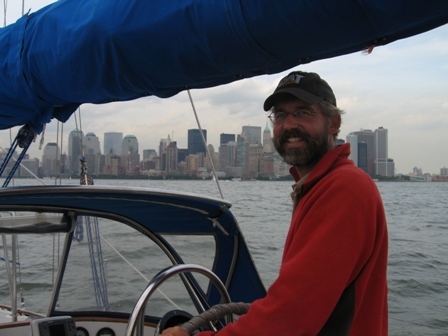 On July 2nd we left the Boat Basin at 0630 hrs to get a fair tide on our way down the Hudson River to sail south of Manhattan into the East River. 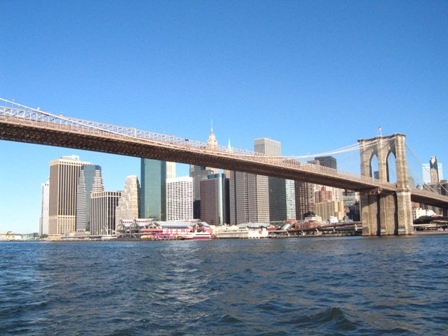 We passed under the Brooklyn Bridge, and got our last view from the enormous Manhattan skyline. We made good progress with the swift currents in the East River and through Hell's Gate, on our way to Long Island Sound. 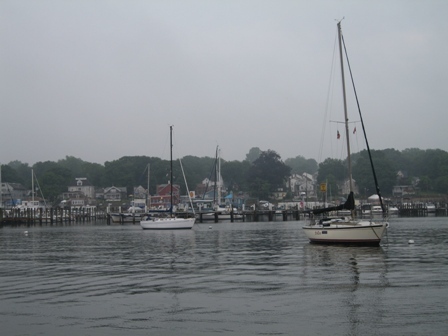 At 1700 hrs we arrived in Port Jefferson along the north side of Long Island. 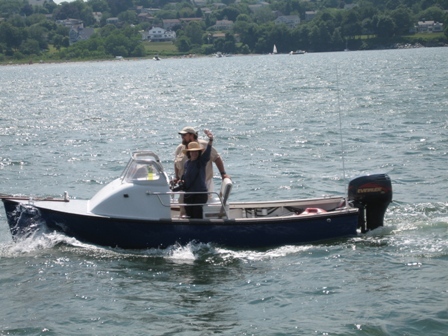 We were able to find a good anchorage, as well as a good fuel dock to top off our diesel tanks. 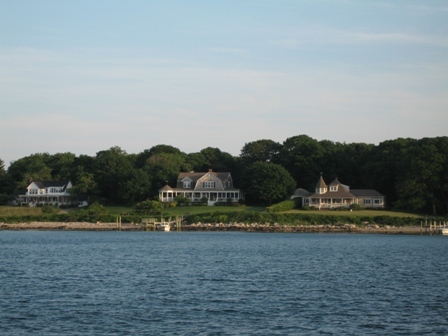 We arrived on Fishers Island at 830 p.m. with the evening sunlight bathing the beautifully manicured waterfront homes. 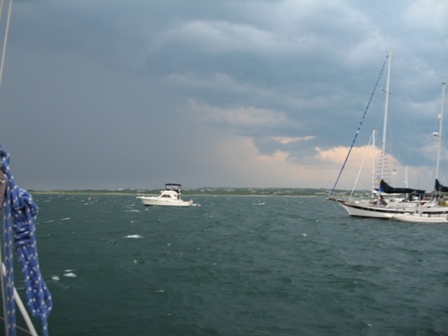 More thunder showers with squalls were in the forecast for the next day after our overnight stay on Fishers Island. We decided to head for New London and stay there for the next two days for the weather to pass. 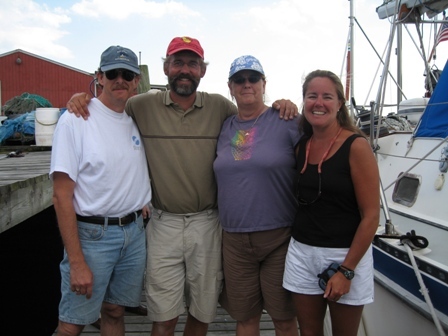 We were able to get a mooring at Burr's Marina, which is a nice family operated marina. A short walk brought us into downtown New London, where there was surprising little to do. 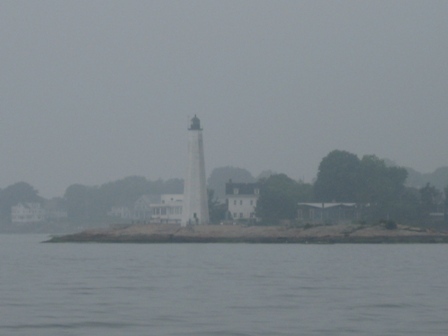 With our pantry restocked we headed for Block Island in the morning fog. 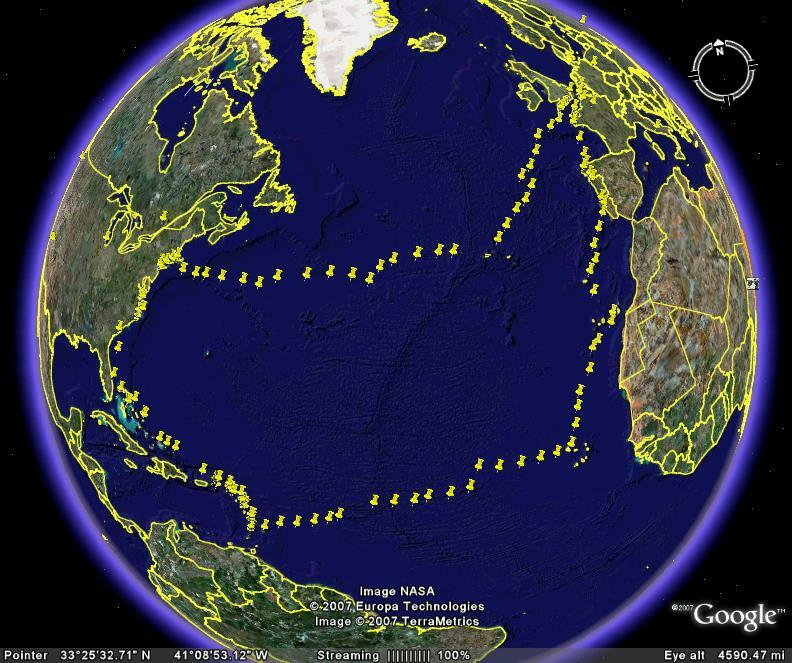 It was hard to believe that we would close the loop around the North Atlantic Ocean later that afternoon. We did it! 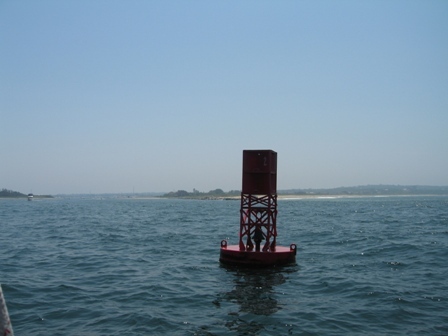 It was a great sense of achievement to sail by the Block Island R2 buoy, where our adventure started one year, one month, and eight days ago. The very place where we had set off to head east across the great Atlantic Ocean. 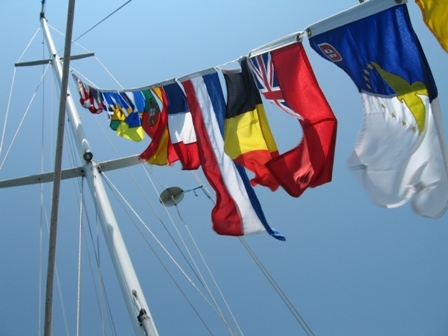 The event was celebrated with Dalliance in full dress with the courtesy flags of all the nations we had visited along the way. We were grinning ear to ear that afternoon, basking in our accomplishment. Even on this last day, we had a squall sweep through the crowded anchorage in Block Island. Luckily our trusty 66 lb. Bruce anchor held us in place once again. 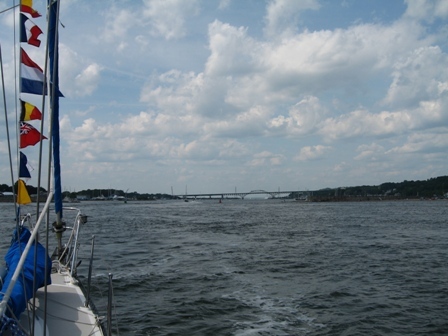 At the north end of the Sakonnet River, Tiverton came into view. Our friends John and Judy came out to meet us in their boat. On the dock of Quality Yacht Services we were greeted by my parents, and my brother David with his wife Katy, and their children Isabel, Claire, and Henry for a very nice welcoming party. 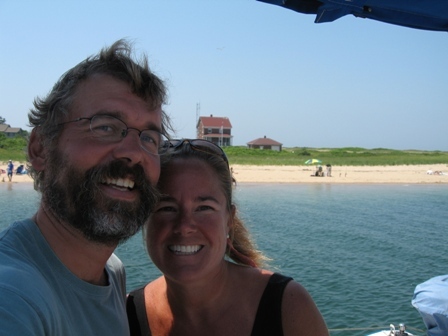 Our friends Carl and Jenny also came out to greet us with their sailboat. Carl was responsible for all those beautiful Google Earth pictures showing our progress during our journey. Back at home, Maren, Cara, and Emma had made a banner welcoming us home. This has really been an amazing trip for us. Something that we had initially dreamed about doing at retirement from our careers, had become a current reality. The satisfaction we received from acting on our dreams is difficult to describe. The fondness for the places we have seen, and the people we have met will stay with us forever. Having said that, travel also makes one truly appreciate coming home to family and friends. We are forever indebted to those who have helped us make this adventure possible.